Brad Doss - InsideOut Solutions, Inc.
Brad hails from the modest southern state of Arkansas. One of his greatest passions is watching his beloved Arkansas Razorbacks in all college sports ( Go Hogs!! ). In 2005, Brad received his Bachelor of Science Degree in Electrical Engineering from the University of Arkansas. After working at the University for a short time, it was clear his enthusiasm to move into different parts of the technology world was present. Brad moved to the Pacific Northwest in early 2009 in search of great adventures and by the lure of the beautiful mountainous area. In late 2009, he joined the InsideOut team to grow his new passion for the web technology world. Shortly after, that passion transcended into reality by becoming an integral part of the web development team. In late 2010, an opportunity to take InsideOut to the next level was presented and Brad took the helm of the systems administration team. 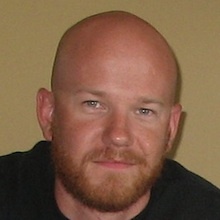 Brad has since become InsideOut’s first true telecommuter when he moved back to his hometown area of Fayetteville, Arkansas in late 2011; where he still resides today. From there, Brad is still able to provide the high level of support and detail to his work that he had grown accustomed to back in the Sequim, Washington office. Setting the bar high to exceed expectations is his daily goal. Brad has always shared a love for the latest and greatest technologies, but he is also an avid outdoor enthusiast; hiking, biking, camping, and climbing at every opportunity. Trying to capture those moments with a camera is a small passion that seems to be constantly evolving. An important moto he lives by daily is to ‘learn something new every day.’ So far, so good! Oh, did we mention music? One would be hard pressed to see Brad without some sort of music playing in his vicinity and the persistent search for great concerts to attend.